Hello you lovely, lovely podcast people! Welcome to another pop’in fresh episode of Comic Impacts Pick of the Week! This week’s episode covers comics from the week of August 5th 2015 and is guaranteed to please (this is not a guarantee). 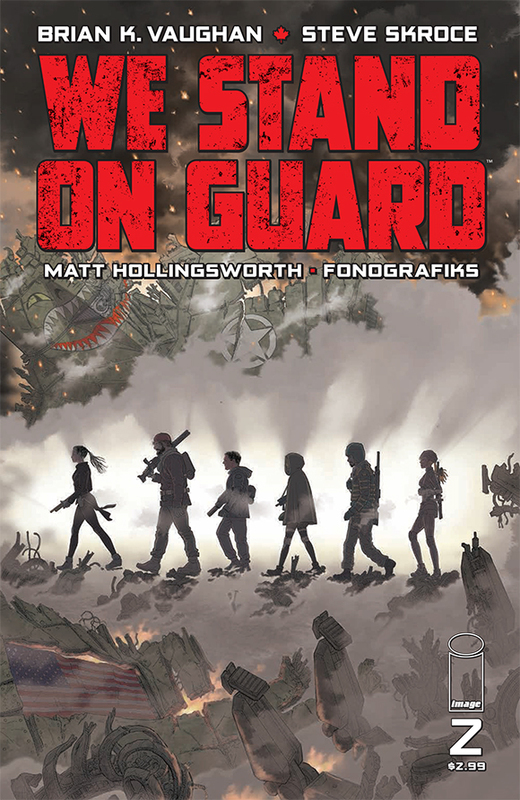 Join Darren,Sheldon and Kirk as they explore the ever-changing landscape of comics!Kirk had the Pick this week and he went with Brian K Vaughn’s New Apocalyptic war tale We Stand on Guard #2 from Image Comics. That’s not all they talk about though no,no,no this episode is wrapped up in a disco fudge brownie of ecstasy and delight as they also discuss Star Wars: Darth Vader,Dark Corridor,Secret Wars:The Infinity Gauntlet,The Fadeout and The Wicked + The Divine. All that and they test out Periscope! That’s right kids Comic Impact will now be Periscoping the podcast on Monday nights so follow us on our twitter feed to see when we are live and we just might end up having you on the show! As always thanks for supporting Comic Impact!